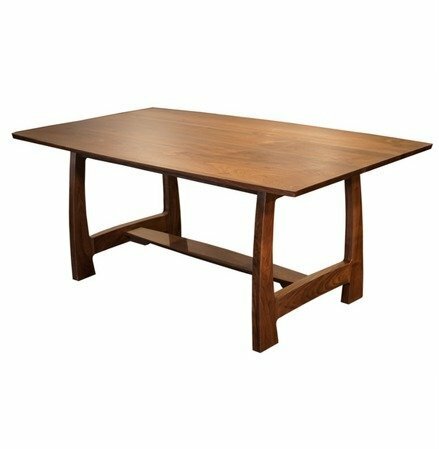 Make a statement in your home with this contemporary Amish Dining Table. This Grand River 72" Dining Table displays a wonderfully unique curvature that will certainly invoke conversation. Handcrafted from your choice of solid wood by our skilled Amish craftsmen ensuring superior quality and attention to detail. Set the scene for all your family and friends with an Amish Table that will last through the generations. This table has a solid top and no extension options. If you would like to order extensions then check out our Amish Grand River Extension Table. We also have our matching Grand River Dining Chairs to complete the set. This table is shown in solid cherry wood.